I’m constantly amazed that visitors to St. Thomas are so surprised by the unique and reliably delicious cuisine served on this “rock”. 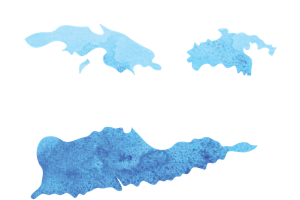 St. Thomas has been hosting travelers and vacationers for hundreds of years. It was a dependable inn at sea for explorers, the refuge for weary seamen, a natural stop-off for inter-island travelers and a premier vacation spot for those from Europe and the Americas with the time and resources to “recharge their batteries” under the Caribbean sun…. that warming sun just 1250 miles from the equator. The local population has always been adept at securing quality foods and spices that defined the regional menu. When pirates first sailed into Charlotte Amalie, it was known as “Taphaus”, the Danish word for beer garden. The locally produced rum flowed like water and those hungry pirates came ashore to erase the taste of the ship’s food, which was (on a good day) boring at best. As non-commercial travel became less arduous, hotels and restaurants opened to delight the growing number of vacation travelers. In 1840 the luxurious Grand Hotel opened its doors in the historic district of Charlotte Amalie and Europeans flocked to its private suites and world-class restaurants. Many others have come and gone over the years but each has added its own special seasoning the to Island’s reputation of extraordinary West Indian cooking. And so it is in the 21 st Century with a new generation of talented chefs who are out to preserve the traditions of years past while adding a global spin to today’s menus. One of this new cadre is Julius Jackson. Born on St. Thomas to world champion boxer, Julian Jackson and reared by a doting family including Grandmas, Aunts and others in a close community, Julian’s upbringing was steeped in West Indian tradition, culture and cuisine. “Our recipes were generations old, handed down in the oral tradition. Nothing was ever written down. When asked how much curry to add, Granny would patiently illustrate with a handful and toss it into the pot. If she had any measuring cups, she chose not to bother. It was always delicious!” She imbued young Julius with a “sense” of what was needed and that served him well as the desire to become a great cook began to dominate his growing list of interests. And, in what seemed like just enough time to boil water, Julius was off to the states for classical culinary training. His apprenticeship with European and mainland chefs filled in the blanks and opened his creativity to a global view of cooking and presentation. He returned to St. Thomas ready to expand upon a solid knowledge base and broaden the scope of Caribbean cuisine. Always a community-minded person he said yes to an offer to train “kids at risk” at My Brothers Workshop Bakery. The task there stretches beyond edible ingredients and includes the components necessary for a positive approach to life. 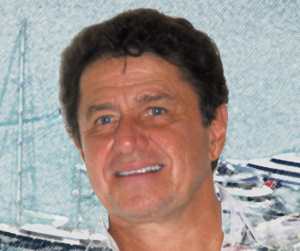 He opened his own catering business and often cooks for celebrity guests on island. Like his dad, he is a professional boxer (and former Olympian) and stays in condition for bouts in Las Vegas and on the east coast. Between the training (both the kids and for boxing), the businesses and his family, Julius has somehow found time to write a cookbook. 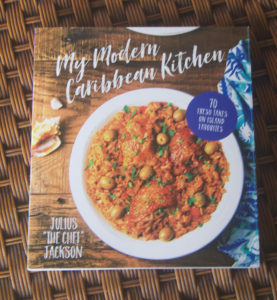 His newly released “My Modern Caribbean Kitchen”, is a handsome compilation of 70 authentic recipes, ranging from basic West Indian staples to exotic deserts and beverages. He has managed to take the family’s oral traditions and add the flair of a well-trained European chef, adding a sophisticated twist to the natural flavors of the island. 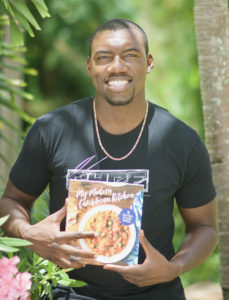 Among the 70 dishes is his “As Seen On TV” Caribbean Stewed Chicken, once featured on the Cooking Channel. It is a signature dish here and could easily become a staple everywhere, as he has simplified the process and developed the flavors to please a broad array of palates. The chapter called “Island Fusion” is notable for its modern twist on local favorites. Coki Beach Seafood Kallaloo Soup is a traditional soup, loaded with fresh greens, shrimp, salt cod and snapper. It was a grandma favorite and her many nephews would come by with fresh-caught seafood to add to the pot. She served it as both an appetizer on holidays and as a full meal. The ingredients are always available and the prep is surprisingly easy. Simple items can become regular treats with ease. Sweet and Savory Pumpkin Fritters are great for easy Sunday morning brunches and tasty snacks. They can be deep or pan-fried. Either way they are easy and quick to prepare. The same goes for “My Mamma’s Banana Fritters” and the Breakfast Pate, which is the Caribbean answer to the many, less healthy morning offerings on the mainland. Then there is his sister-in-law’s Coquito, a boozy, creamy holiday drink based on an old Puerto Rican recipe, peanut punch, more of a snack than a drink and various juice concoctions that refresh and the home-brewed ginger beer, made from fresh ginger, vanilla and honey. There is something for everyone in this beautiful book. I have sent copies to St. Thomas lovers back in the states who thank me for sending them a “176-page visit back to the islands”. 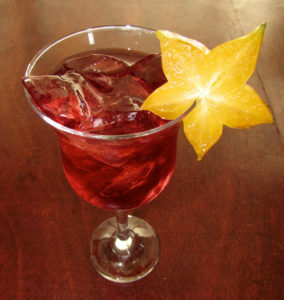 It keeps the tradition alive, records the details and augments the local flavors with modern lightness and complexity. It is a way to bring the joy of St. Thomas home with you to stay. Julius “the chef” Jackson’s book can be ordered through Amazon for $21.99. Or, stop in to My Brothers Workshop Bakery on Back Street in Charlotte Amalie and Julius will be happy to sign your copy. Bon Appetit. Gerard became a St. Thomas resident 13 years ago, after a decade of escaping Boston winters on chartered sailboats in the Virgin Islands. Back in the frozen north he published travel magazines, books and consulted on all types of media. “It was love at first sight”, says Gerard. “I came for the sailing but stayed for the weather, the culture and the genuine warmth of the people.” Once settled in, he augmented his media consultation with a professional photography business and various philanthropical efforts in the community including National Public Radio and the St. Thomas Humane Society. He manages St. Thomas Food Tours, the original cultural food tour on the island where he shares his love and knowledge of “the rock” with visitors who want to leave with more than a suntan.